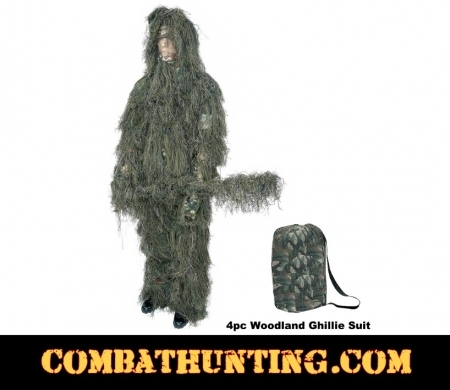 Ghillie Suit Sniper Camo 3D Woodland Camouflage Military style 4pc set the perfect clothing for forest hunting and stalking and wildlife photography or birdwatching. Ghillie Suit Blend into your woodland surroundings with the best camouflage ghilli suit on the market. The 4pc Woodland Ghillie Suit includes jacket, pants, removable hood, and rifle wrap. Features fire-retardant camouflage fibers; lightweight, breathable interior lining; and mildew-resistant materials. Storage bag with carry strap included. Approximate weight is 4.5 pounds.